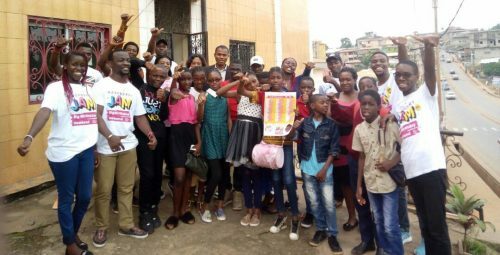 As the image on the right shows, Microsoft’s Universal Windows Platform (UWP) is a system that enables software developers to create applications that can run across many devices. 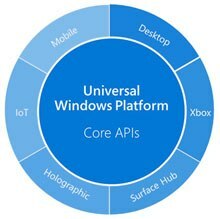 “The Universal Windows Platform (UWP) is the app platform for Windows 10. You can develop apps for UWP with just one API set, one app package, and one store to reach all Windows 10 devices – PC, tablet, phone, Xbox, HoloLens, Surface Hub and more,” Microsoft explains. While the benefits of such a system are immediately apparent, critics say that UWP gives Microsoft an awful lot of control, not least since UWP software must be distributed via the Windows Store with Microsoft taking a cut. Or that was the plan, at least. Last evening it became clear that the UWP system, previously believed to be uncrackable, had fallen to pirates. 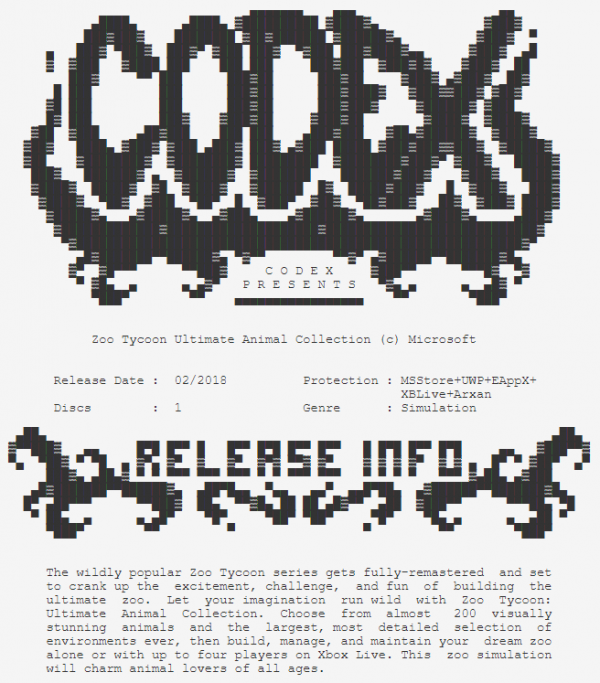 After being released on October 31, 2017, the somewhat underwhelming Zoo Tycoon Ultimate Animal Collection became the first victim at the hands of popular scene group, CODEX. “This is the first scene release of a UWP (Universal Windows Platform) game. Therefore we would like to point out that it will of course only work on Windows 10. This particular game requires Windows 10 version 1607 or newer,” the group said in its release notes. CODEX says it’s important that the game isn’t allowed to communicate with the Internet so the group advises users to block the game’s executable in their firewall. While that’s not a particularly unusual instruction, CODEX did reveal that various layers of protection had to be bypassed to make the game work. They’re listed by the group as MSStore, UWP, EAppX, XBLive, and Arxan, the latter being an anti-tamper system. Arxan’s marketing comes off as extremely confident but may need amending in light of yesterday’s developments. “Arxan uses code protection against reverse-engineering, key and data protection to secure servers and fortification of game logic to stop the bad guys from tampering. Sorry hackers, game over,” the company’s marketing reads. What is unclear at this stage is whether Zoo Tycoon Ultimate Animal Collection represents a typical UWP release or if some particular flaw allowed CODEX to take it apart. The possibility of additional releases is certainly a tantalizing one for pirates but how long they will have to wait is unknown. Whatever the outcome, Arxan calling “game over” is perhaps a little premature under the circumstances but in this continuing arms race, they probably have another version of their anti-tamper tech up their sleeves…..
Now this is good news. The UK’s National Cyber Security Centre (NCSC) — part of GCHQ — found a serious vulnerability in Windows Defender (their anti-virus component). Instead of keeping it secret and all of us vulnerable, it alerted Microsoft. I’d like believe the US does this, too. There’s a little company called Apple making big announcements this week, but about 45% of you are on Windows machines, so we thought it would be a good idea to devote a blog post today to Windows users and the options they have for backing up Windows computers. We’ll be talking about the various options for backing up Windows desktop OS’s 7, 8, and 10, and Windows servers. 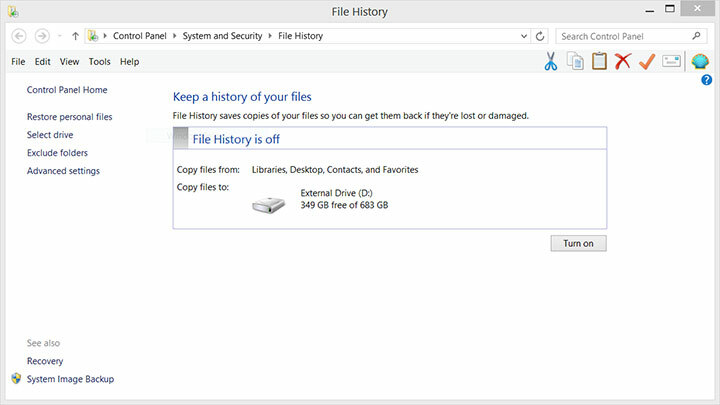 We’ve written previously about this topic in How to Back Up Windows, and Computer Backup Options, but we’ll be covering some new topics and ways to combine strategies in this post. So, if you’re a Windows user looking for shelter from all the Apple hoopla, welcome to our Apple Announcement Day Windows Backup Day post. This might seem to our readers like an unneeded appetizer on the way to the main course of our post, but we at Backblaze know that people often mean very different things when they use backup and related terms. Let’s start by defining what we mean when we say backup, cloud storage, sync, and archive. A backup is an active copy of the system or files that you are using. It is distinguished from an archive, which is the storing of data that is no longer in active use. Backups fall into two main categories: file and image. File backup software will back up whichever files you designate by either letting you include files you wish backed up or by excluding files you don’t want backed up, or both. An image backup, sometimes called a disaster recovery backup or a system clone, is useful if you need to recreate your system on a new drive or computer. The first backup generally will be a full backup of all files. After that, the backup will be incremental, meaning that only files that have been changed since the full backup will be added. Often, the software will keep changed versions of the files for some period of time, so you can maintain a number of previous revisions of your files in case you wish to return to something in an earlier version of your file. The destination for your backup could be another drive on your computer, an attached drive, a network-attached drive (NAS), or the cloud. Cloud storage vendors supply data storage just as a utility company supplies power, gas, or water. Cloud storage can be used for data backups, but it can also be used for data archives, application data, records, or libraries of photos, videos, and other media. You contract with the service for storing any type of data, and the storage location is available to you via the internet. Cloud storage providers generally charge by some combination of data ingress, egress, and the amount of data stored. File sync is useful for files that you wish to have access to from different places or computers, or for files that you wish to share with others. While sync has its uses, it has limitations for keeping files safe and how much it could cost you to store large amounts of data. As opposed to backup, which keeps revision of files, sync is designed to keep two or more locations exactly the same. Sync costs are based on how much data you sync and can get expensive for large amounts of data. A data archive is for data that is no longer in active use but needs to be saved, and may or may not ever be retrieved again. In old-style storage parlance, it is called cold storage. An archive could be stored with a cloud storage provider, or put on a hard drive or flash drive that you disconnect and put in the closet, or mail to your brother in Idaho. What’s the Best Strategy for Backing Up? Now that we’ve got our terminology clear, let’s talk backup strategies for Windows. At Backblaze, we advocate the 3-2-1 strategy for safeguarding your data, which means that you should maintain three copies of any valuable data — two copies stored locally and one stored remotely. I follow this strategy at home by working on the active data on my Windows 10 desktop computer (copy one), which is backed up to a Drobo RAID device attached via USB (copy two), and backing up the desktop to Backblaze’s Personal Backup in the cloud (copy three). I also keep an image of my primary disk on a separate drive and frequently update it using Windows 10’s image tool. I use Dropbox for sharing specific files I am working on that I might wish to have access to when I am traveling or on another computer. Once my subscription with Dropbox expires, I’ll use the latest release of Backblaze that has individual file preview with sharing built-in. Before you decide which backup strategy will work best for your situation, you’ll need to ask yourself a number of questions. These questions include where you wish to store your backups, whether you wish to supply your own storage media, whether the backups will be manual or automatic, and whether limited or unlimited data storage will work best for you. The first copy of the data you are working on is often on your desktop or laptop. You can create a second copy of your data on another drive or directory on your computer, or copy the data to a drive directly attached to your computer, such as via USB. Windows has built-in tools for both file and image level backup. Depending on which version of Windows you use, these tools are called Backup and Restore, File History, or Image. These tools enable you to set a schedule for automatic backups, which ensures that it is done regularly. You also have the choice to use Windows Explorer (aka File Explorer) to manually copy files to another location. Some external disk drives and USB Flash Drives come with their own backup software, and other backup utilities are available for free or for purchase. This is a supply-your-own media solution, meaning that you need to have a hard disk or other medium available of sufficient size to hold all your backup data. When a disk becomes full, you’ll need to add a disk or swap out the full disk to continue your backups. We’ve written previously on this strategy at Should I use an external drive for backup? Computers, servers, and network-attached-storage (NAS) on your local network all can be used for backing up data. Microsoft’s built-in backup tools can be used for this job, as can any utility that supports network protocols such as NFS or SMB/CIFS, which are common protocols that allow shared access to files on a network for Windows and other operatings systems. There are many third-party applications available as well that provide extensive options for managing and scheduling backups and restoring data when needed. Multiple computers can be backed up to a single network-shared computer, server, or NAS, which also could then be backed up to the cloud, which rounds out a nice backup strategy, because it covers both local and remote copies of your data. System images of multiple computers on the LAN can be included in these backups if desired. 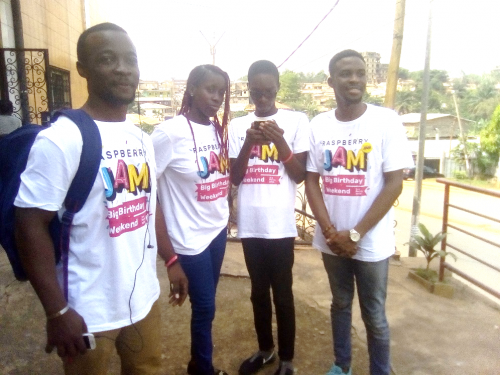 Again, you are managing the backup media on the local network, so you’ll need to be sure you have sufficient room on the destination drives to store all your backup data. You may have have read our recent blog post, Getting Data Archives Out of Your Closet, in which we discuss the practice of filling hard drives and storing them in a closet. Of course, to satisfy the off-site backup guideline, these drives would need to be stored in a closet that’s in a different geographical location than your main computer. If you’re willing to do all the work of copying the data to drives and transporting them to another location, this is a viable option. 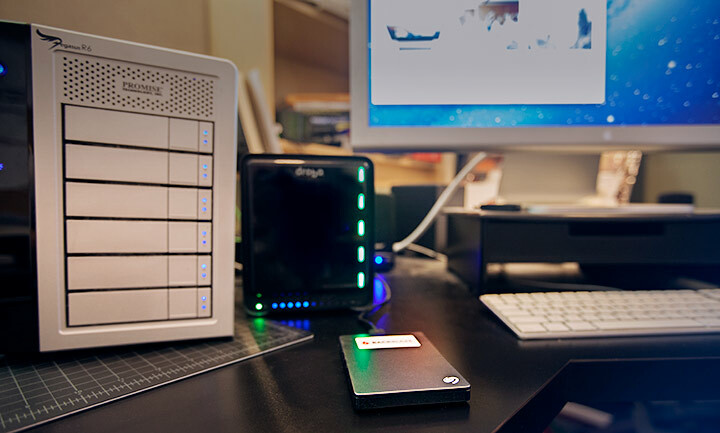 The only limitation to the amount of backup data is the number of hard drives you are willing to purchase — and maybe the size of your closet. Backing up to the cloud has become a popular option for a number of reasons. Internet speeds have made moving large amounts of data possible, and not having to worry about supplying the storage media simplifies choices for users. 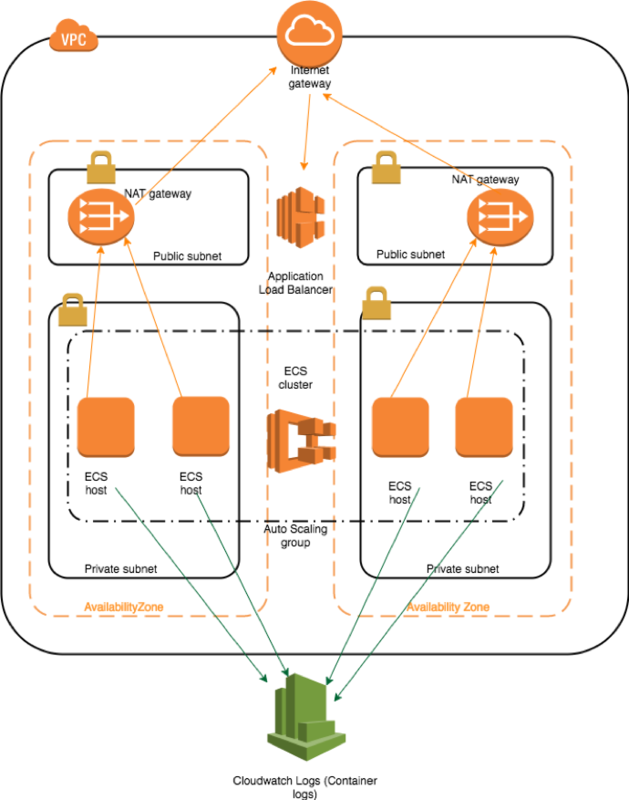 Additionally, cloud vendors implement features such as data protection, deduplication, and encryption as part of their services that make cloud storage reliable, secure, and efficient. Unlimited cloud storage for data from a single computer is a popular option. A backup vendor likely will provide a software client that runs on your computer and backs up your data to the cloud in the background while you’re doing other things, such as Backblaze Personal Backup, which has clients for Windows computers, Macintosh computers, and mobile apps for both iOS and Android. For restores, Backblaze users can download one or all of their files for free from anywhere in the world. Optionally, a 128 GB flash drive or 4 TB drive can be overnighted to the customer, with a refund available if the drive is returned. 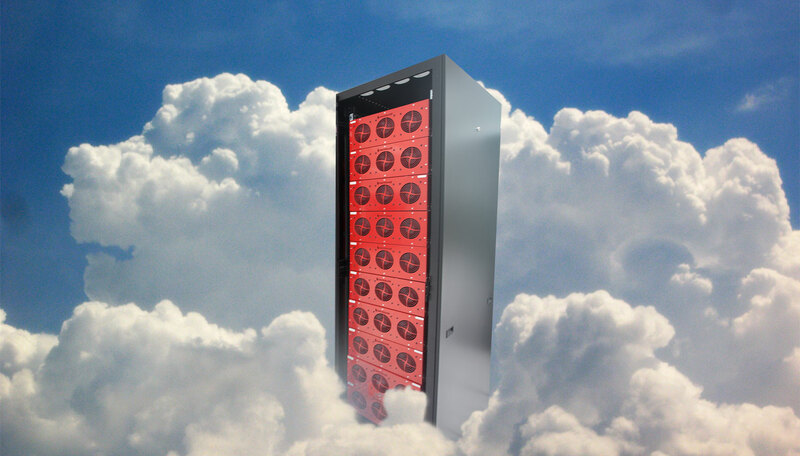 Backblaze B2 Cloud Storage is an option for those who need capabilities beyond Backblaze’s Personal Backup. B2 provides cloud storage that is priced based on the amount of data the customer uses, and is suitable for long-term data storage. 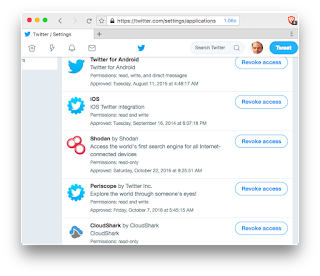 B2 supports integrations with NAS devices, as well as Windows, Macintosh, and Linux computers and servers. Services such as BackBlaze B2 are often called Cloud Object Storage or IaaS (Infrastructure as a Service), because they provide a complete solution for storing all types of data in partnership with vendors who integrate various solutions for working with B2. B2 has its own API (Application Programming Interface) and CLI (Command-line Interface) to work with B2, but B2 becomes even more powerful when paired with any one of a number of other solutions for data storage and management provided by third parties who offer both hardware and software solutions. Windows Servers are popular workstations for some users, and provide needed network services for others. They also can be used to store backups from other computers on the network. They, in turn, can be backed up to attached drives or the cloud. While our Personal Backup client doesn’t support Windows servers, our B2 Cloud Storage has a number of integrations with vendors who supply software or hardware for storing data both locally and on B2. We’ve written a number of blog posts and articles that address these solutions, including How to Back Up your Windows Server with B2 and CloudBerry. The great thing about computers, software, and networks is that there is an endless number of ways to combine them. Our users and hardware and software partners are ingenious in configuring solutions that save data locally, copy it to an attached or network drive, and then store it to the cloud. 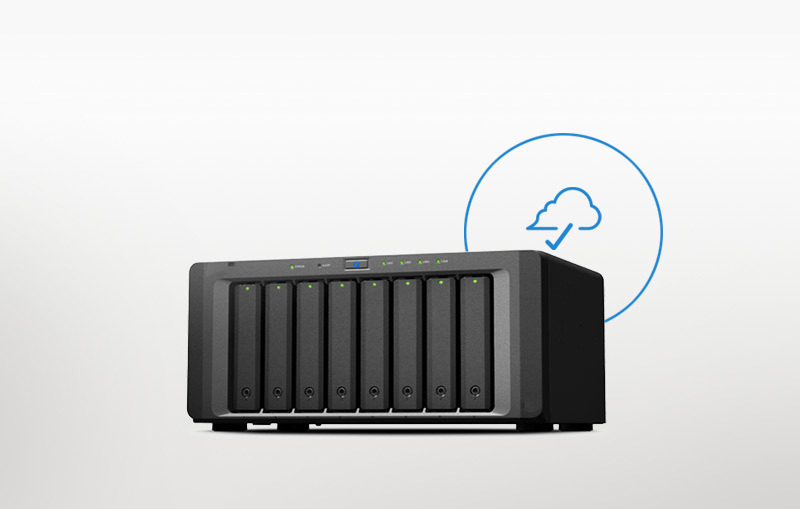 Among our B2 partners, Synology, CloudBerry Archiware, QNAP, Morro Data, and GoodSync have integrations that allow their NAS devices to store and retrieve data to and from B2 Cloud Storage. 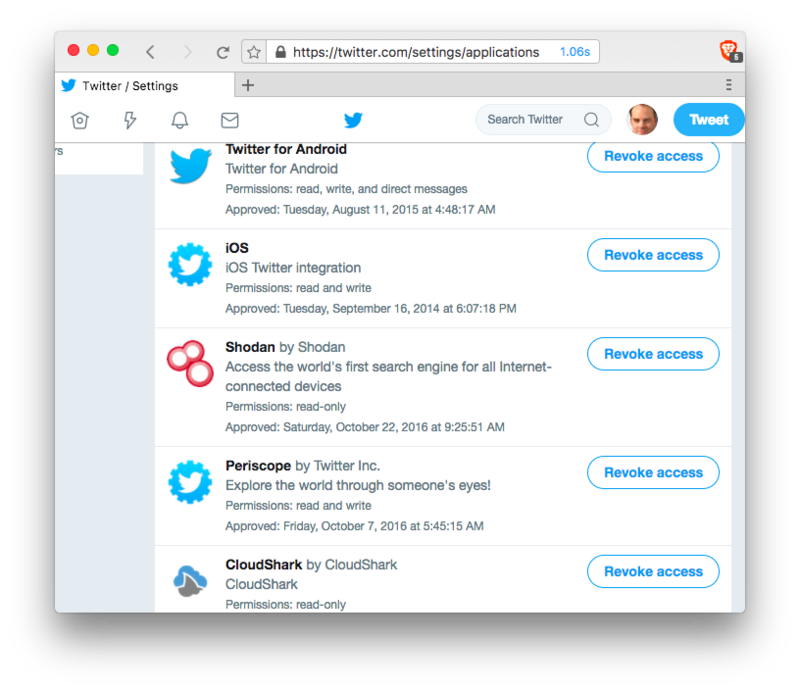 For a drag-and-drop experience on the desktop, take a look at CyberDuck, MountainDuck, and Dropshare, which provide users with an easy and interactive way to store and use data in B2. If you’d like to explore more options for combining software, hardware, and cloud solutions, we invite you to browse the integrations for our many B2 partners. Windows versions, tools, and backup terminology all can be confusing, and we know how hard it can be to make sense of all of it. If there’s something we haven’t addressed here, or if you have a question or contribution, please let us know in the comments. The post Strategies for Backing Up Windows Computers appeared first on Backblaze Blog | Cloud Storage & Cloud Backup. This 3D-printed Raspberry PI-powered Rubik’s Cube solving robot has everything any serious robot does — arms, servos, gears, vision, artificial intelligence and a task to complete. If you want to introduce robotics to your kids or your students, this is the perfect machine for it. This robot is fully 3D-printable. As Liz has said before, we have a lot of Rubik’s cubes here at Pi Towers. In fact, let me just…hold on…I’ll be right back. Okay, these are all the ones I found on Gordon’s desk, and I’m 99% sure there are more in his drawers. And that’s just Gordon. Given that there’s a multitude of other Pi Towers staff members who are also obsessed with the little twisty cube of wonder, you could use what you find in our office to restock an entire toy shop for the pre-Christmas rush! So yeah, we like Rubik’s Cubes. 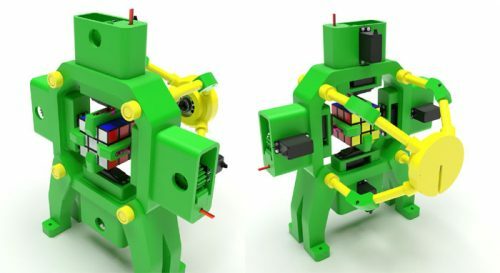 Aside from the obvious electronic elements, Otvinta’s Rubik’s Cube Solving Robot is completely 3D-printable. While it may take a whopping 70 hours of print time and a whole spool of filament to make your solving robot a reality, we’ve seen far more time-consuming prints with a lot less purpose than this. 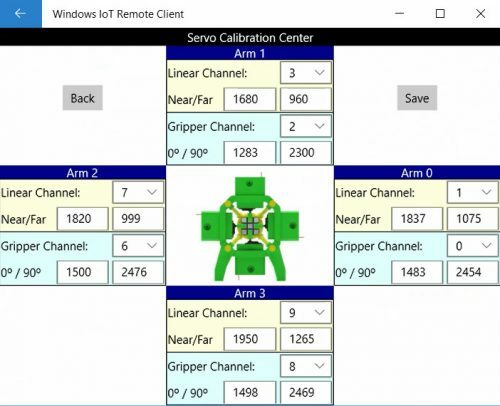 After 3D printing all the necessary parts of your Rubik’s Cube Solving Robot, you’ll need to run the Windows 10 IoT Core on your Raspberry Pi. Once connected to your network, you can select the Pi from the IoT Dashboard on your main PC and install the RubiksCubeRobot app. Then simply configure the robot via the app, and you’re good to go! 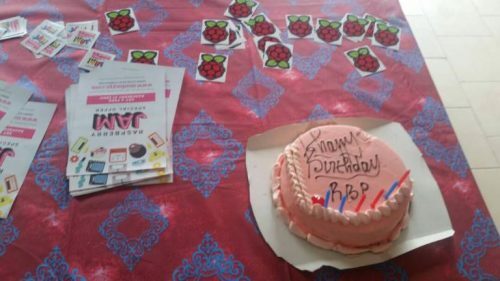 You might not necessarily need a Raspberry Pi to create this build, since you could simply run the app on your main PC. 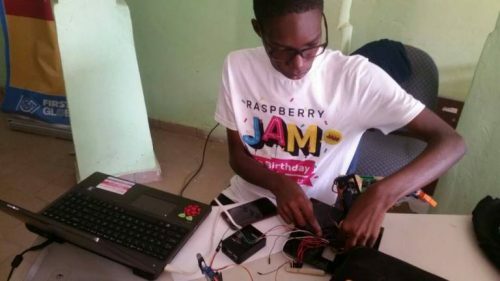 However, using a Pi will make your project more manageable and less bulky. 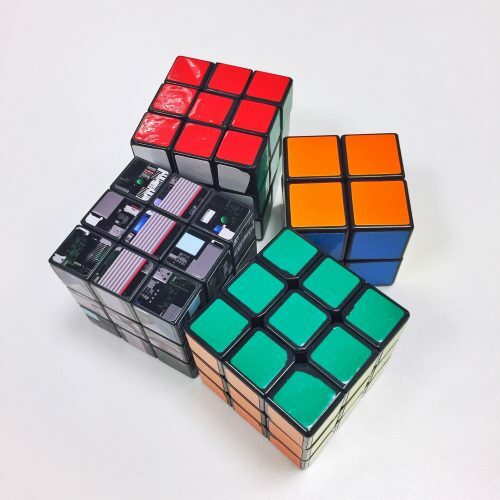 You can find all the details of how to make your own Rubik’s Cube Solving Robot on Otvinta’s website, so do make sure to head over there if you want to learn more. This isn’t the first Raspberry Pi-powered Rubik’s Cube out there, and it surely won’t be the last. There’s this one by Francesco Georg using LEGO Mindstorms; this one was originally shared on Reddit; Liz wrote about this one; and there’s one more which I can’t seem to find but I swear exists, and it looks like the Eye of Sauron! Ten House Points to whoever shares it with me in the comments below. The post 3D print your own Rubik’s Cube Solver appeared first on Raspberry Pi. Because there is zero downside, the first time it could, Apple shipped with 64-bit OS support. Apple did not give customers the option of “turning off all 64-bit programs.” Apple first shipped 64-bit support in OS X 10.6 Tiger in 2009 (which also had 32-bit support, so there was zero downside to the decision). 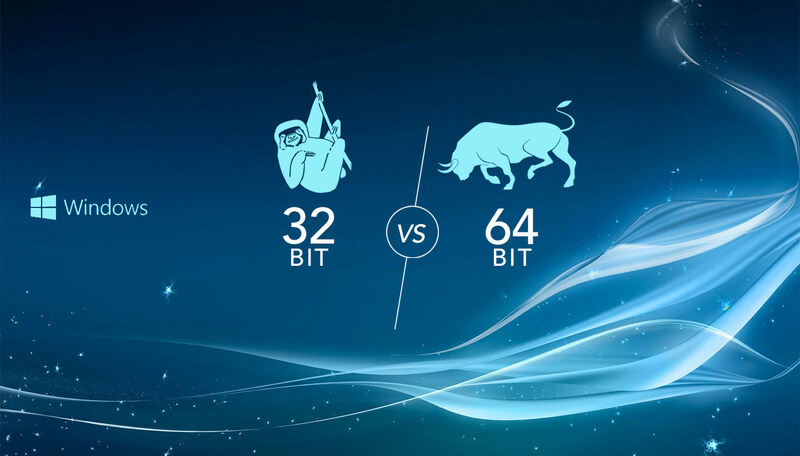 The post An Open Letter To Microsoft: A 64-bit OS is Better Than a 32-bit OS appeared first on Backblaze Blog | Cloud Storage & Cloud Backup. I am a big believer in hands-on experience. Except under very rare circumstances, the posts in my blog are written only after I have used the service in question. 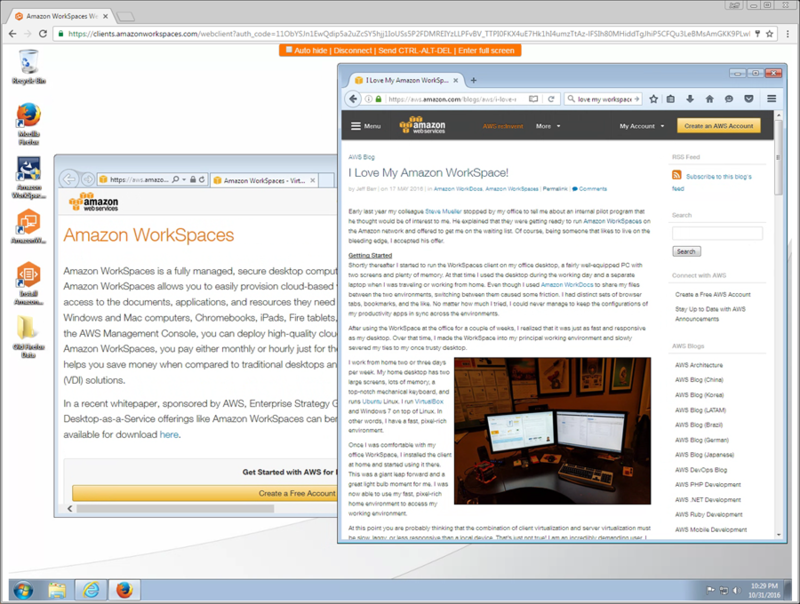 If you happened to read I Love My Amazon WorkSpace, you know that Amazon WorkSpaces is one of my most important productivity tools. I would like to tell you about an opportunity for you to try WorkSpaces on your own at no charge. 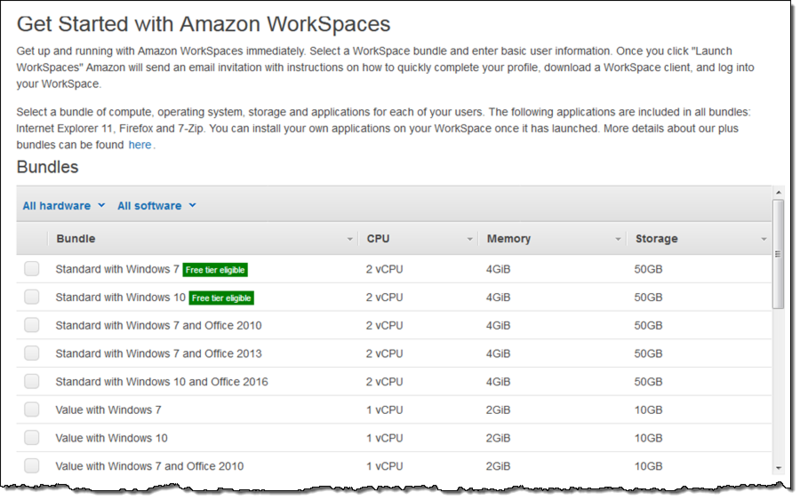 The new Amazon WorkSpaces Free Tier allows you to launch two Standard bundle WorkSpaces and use them for a total of 40 hours per month, for up to two calendar months. You can choose either the Windows 7 or the Windows 10 Desktop Experience, both powered by Windows Server. Both options include Internet Explorer 11, Mozilla Firefox, 7-Zip, and Amazon WorkDocs with 50 GB of storage. 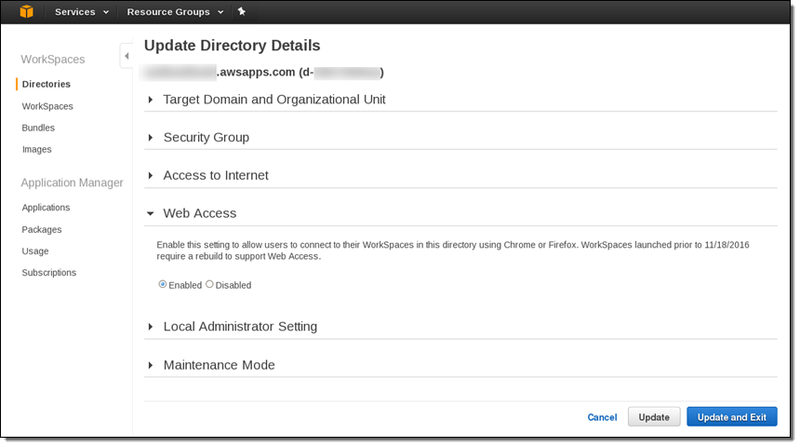 In order to take advantage of the free tier you must run the WorkSpaces in AutoStop mode, which is selected for you by default. Unused hours expire at the end of the first calendar month and the free tier offer expires at the end of the second calendar month. 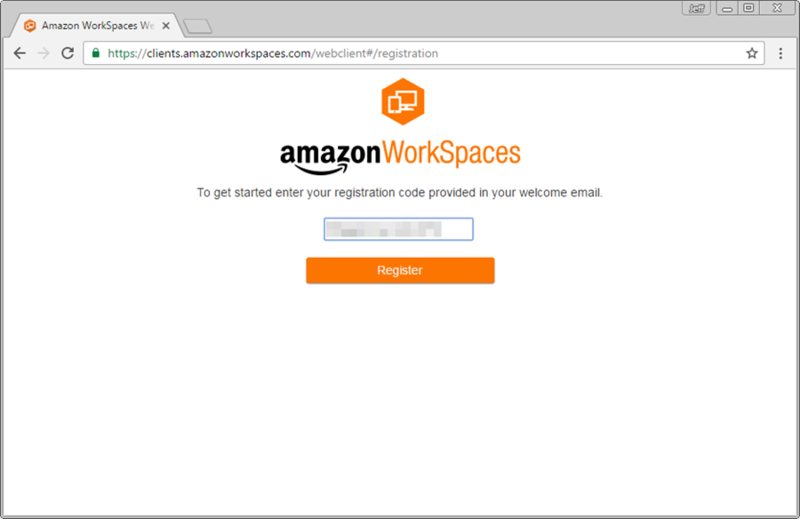 After that you will be billed at the hourly rate listed on the Amazon WorkSpaces Pricing page. 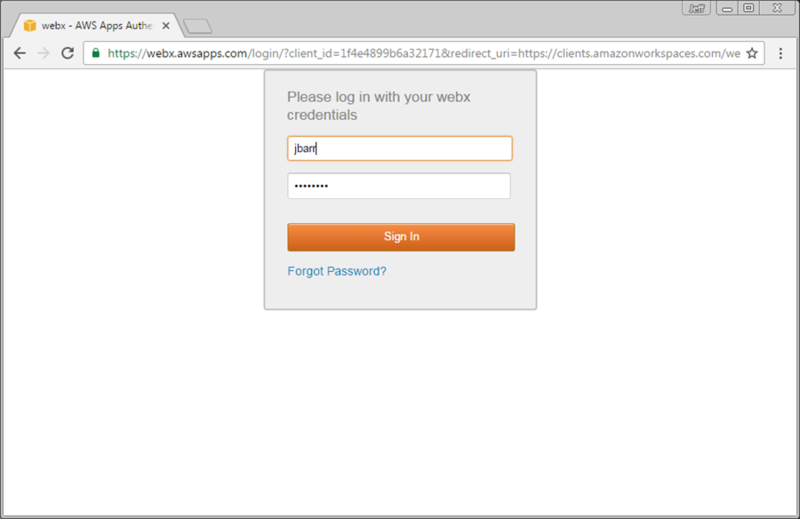 This offer is available in all AWS Regions where WorkSpaces is available. proprietary desktop software. “Under a proposal backed by the general council, the administration will investigate how long it will take and how much it will cost to build a Windows 10 client for use by the city’s employees. 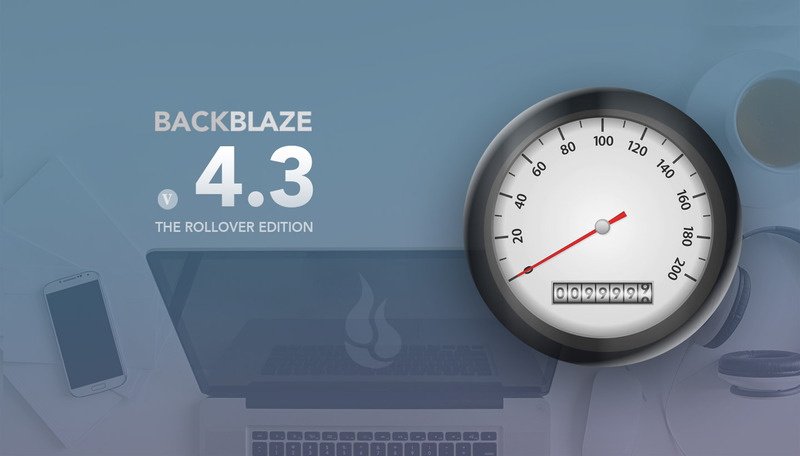 The post Release 4.3.0 – The Rollover Release appeared first on Backblaze Blog | Cloud Storage & Cloud Backup. Here’s another installment of Tech to Track, a list of cool technology links we’re interested in and thought we’d share with you. A Florida resident, David Gewirtz regularly weathers battering storm like the recent Hurricane Matthew. He makes an interesting comparison between public utilities and cloud computing platforms, and what happens when both stop working. Not to put too fine a point on it, but it’s one of the reasons why we’re so adamant about the 3-2-1 Backup Strategy. 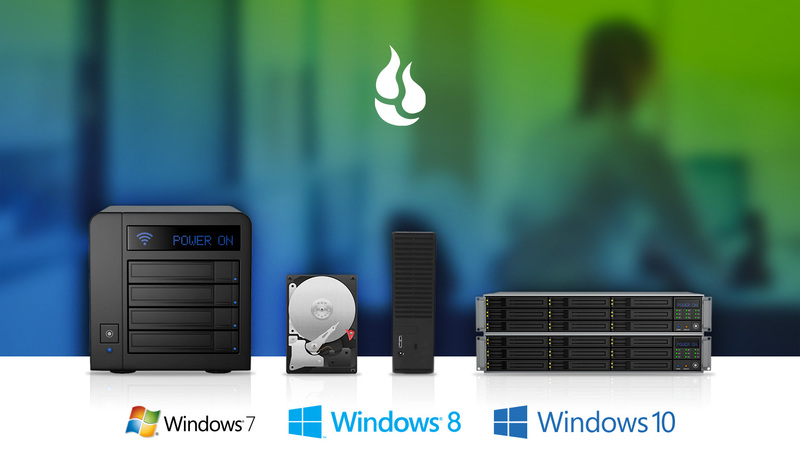 Go local with your backup, then go to the cloud (with Backblaze). That way you’re covered even if Internet connectivity goes down. Google’s putting the brakes on new high-speed fiber optic network rollouts, but it doesn’t necessarily mean the end of this project — just a “review of strategy,” according to a new report. Google Fiber already operates in a handful of cities; Google is committed to building out other locations. But Google’s halted further expansion plans to Dallas, Jacksonville, Los Angeles, San Jose, Oklahoma City, Phoenix, Portland, and Tampa. Google may instead focus on new and forthcoming high-speed wireless technology to help get massive bandwidth to customers. How are your high-speed options? Are you lucky enough to be in a Google Fiber area? 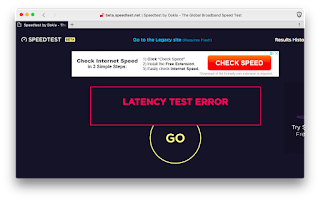 Do you have a fiber connection through another provider, cable, or something else? Tell us in the comments. Microsoft wants to out-Apple Apple with its minimalist Surface Studio, a desktop computer with 28-inch LCD display. The Surface Studio works with Microsoft’s Surface Pen and a new Dial input device. 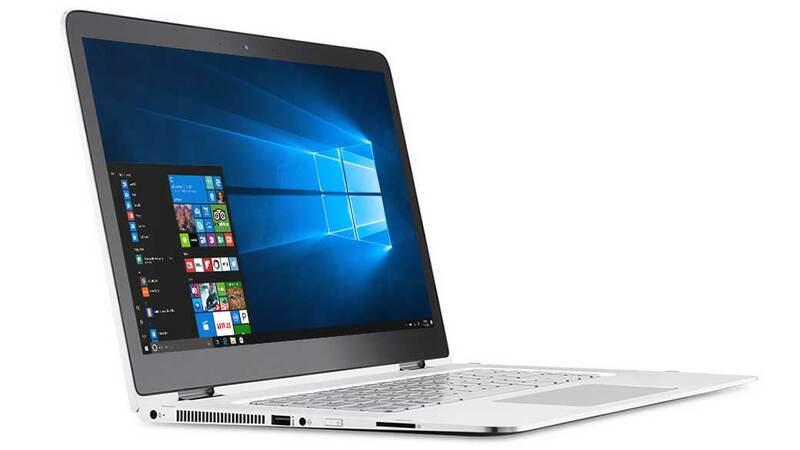 There’s an Intel Core i5 or i7 processor inside with up to 32 GB RAM. It’s not for the faint-of-wallet, though: The new computer goes on sale this holiday season starting at just a skosh under $3,000. The good news is that it’s a Windows 10 device, so you can install Backblaze on it and be sure you’ve backed up all your new creative work! But maybe you should keep a whiteboard and some markers around just in case the occasional grumpy NFL coach shows up. Not to be outdone, Apple is revamping its venerable MacBook Pro line with a new model that’s faster, thinner and lighter than before, with Thunderbolt 3 ports, better Retina Display, and bigger trackpad. The centerpiece is a new Touch Bar OLED (Organic Light-Emitting Diode) interface that replaces function keys: It’s software-programmable, so the interface changes depending on which app you’re using. Laptops with the new Touch Bar come in 13 and 15-inch sizes starting at about $1,800. You also get your color choice of silver or space gray. Some of the new innovations look cool, but what’s holding up Apple’s release of new desktop systems? 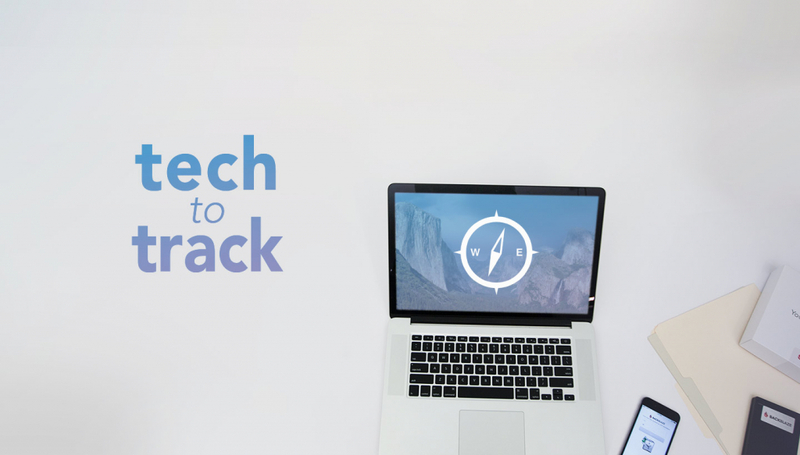 The post Tech to Track: Cloud computing and public utilities, new gear from MS and Apple and more appeared first on Backblaze Blog | Cloud Storage & Cloud Backup. There’s a story going round that Lenovo have signed an agreement with Microsoft that prevents installing free operating systems. This is sensationalist, untrue and distracts from a genuine problem. The background is straightforward. Intel platforms allow the storage to be configured in two different ways – “standard” (normal AHCI on SATA systems, normal NVMe on NVMe systems) or “RAID”. “RAID” mode is typically just changing the PCI IDs so that the normal drivers won’t bind, ensuring that drivers that support the software RAID mode are used. Intel have not submitted any patches to Linux to support the “RAID” mode. In this specific case, Lenovo’s firmware defaults to “RAID” mode and doesn’t allow you to change that. Since Linux has no support for the hardware when configured this way, you can’t install Linux (distribution installers will boot, but won’t find any storage device to install the OS to). Why would Lenovo do this? I don’t know for sure, but it’s potentially related to something I’ve written about before – recent Intel hardware needs special setup for good power management. The storage driver that Microsoft ship doesn’t do that setup. The Intel-provided driver does. “RAID” mode prevents the Microsoft driver from binding and forces the user to use the Intel driver, which means they get the correct power management configuration, battery life is better and the machine doesn’t melt. Things are somewhat obfuscated due to a statement from a Lenovo rep: This system has a Signature Edition of Windows 10 Home installed. It is locked per our agreement with Microsoft. It’s unclear what this is meant to mean. Microsoft could be insisting that Signature Edition systems ship in “RAID” mode in order to ensure that users get a good power management experience. Or it could be a misunderstanding regarding UEFI Secure Boot – Microsoft do require that Secure Boot be enabled on all Windows 10 systems, but (a) the user must be able to manage the key database and (b) there are several free operating systems that support UEFI Secure Boot and have appropriate signatures. Neither interpretation indicates that there’s a deliberate attempt to prevent users from installing their choice of operating system. The real problem here is that Intel do very little to ensure that free operating systems work well on their consumer hardware – we still have no information from Intel on how to configure systems to ensure good power management, we have no support for storage devices in “RAID” mode and we have no indication that this is going to get better in future. If Intel had provided that support, this issue would never have occurred. Rather than be angry at Lenovo, let’s put pressure on Intel to provide support for their hardware.